In 2009, Dr Charlotte Boyce & Dr Páraic Finnerty from the School of Social, Historical & Literary Studies at the University of Portsmouth received a grant from the Higher Education Innovation Fund (HEIF) to create resources that promote a better understanding of Alfred Lord Tennyson’s time on the Isle of Wight &, in particular, the circle of nineteenth-century celebrities he associated with there: important cultural figures such as Julia Margaret Cameron, Lewis Carroll, John Millais, G. F. Watts & Ellen Terry. 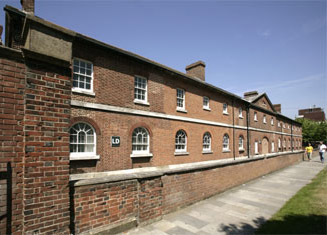 The Milldam buildings (former barracks built around 1830) are the current home of the School of Social, Historical & Literary Studies. As part of this initiative, Drs Boyce & Finnerty, working with their research assistant Dr Anne Marie Millim, produced a glossy booklet on the Circle & organise a conference in 2013, which will invite national & international scholars to explore the nature, significance & activities of this coterie of artists, writers, performers; the cultural importance of the Isle of Wight in the nineteenth-century Britain; Victorian celebrity; & interconnections between literature & the visual & performing arts. Drs Boyce & Finnerty also worked with the Online Development team, Dr Emily Bennett & Peter Sparkes, to produce this web resource, which includes an interactive map of Freshwater for people to explore & discover more about the key figures in the Circle. The project builds on the University of Portsmouth’s commitment to support & drive forward innovation & create partnerships between the private & public sectors by bringing together a range of arts & educational bodies to produce resources that publicise the Isle of Wight’s Victorian heritage & cultural assets. Collaborators on this project include Farringford House, Dimbola Lodge & the Isle of Wight Library & Museum Services.